We're a small, Canadian, family-run specialty bakery that believes allergies shouldn't stop you from eating what you love! Offering vegan, veg, dairy-free, free of cane sugar, flourless, low-carb, soy-free, bean-free, nut-free, peanut-free & sesame-free options! Peachy founded Organic Oven in 2002. Starting as an organic bakery, the main facility soon expanded to be 100% gluten free and allergen-friendly. Don’t be alarmed by our small store-front. It’s jam-packed with lots of gluten-free goodies, and we’re open to the public! Cakes, cupcakes, cookies and most treats are available daily. 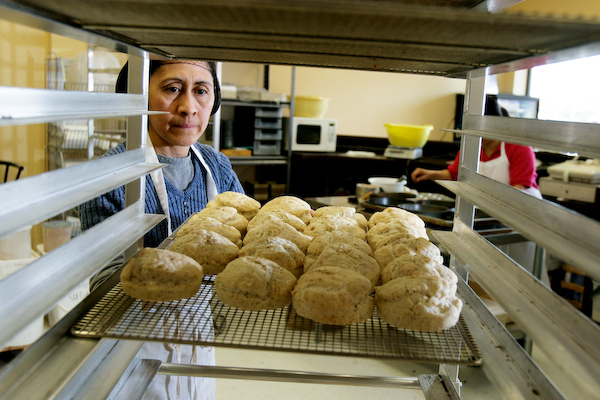 Breads, bagels, muffins and pound cakes are usually made to order. Please order at least two business days before your visit. We do carry a small selection of freshly baked breads and bagels. Otherwise, we always keep our freezer stocked with your favourites, in case you forget to call ahead! We bring our treats right to your home or office for a flat fee. Please call to confirm whether we deliver to your area. We make special deliveries to other areas. Please contact us via email (info@organicoven.com) or phone (905-459-2333) to make arrangements. Wedding cake quotes include delivery within the GTA. WE HAVE BEEN EXPERIENCING INTERMITTENT ISSUES WITH THIS CONTACT FORM. WE RECOMMEND EMAILING US DIRECTLY FROM YOUR OWN EMAIL CLIENT OR CONTACTING US THROUGH FACEBOOK MESSENGER. Direct email: info "at" organicoven.com. We apologize for any inconvenience.